Name, age, hometown: Joe Smith, 19, Urbandale, Iowa. What corps are you in and what is your role this summer? I play mellophone for the Santa Clara Vanguard. Where I go to school and what I'm studying: I'm currently going to community college and majoring in liberal arts. Joe Smith (right) and Megan Arns. Give us your full drum corps/marching music background. I started marching band my freshman year, and did that for four years. 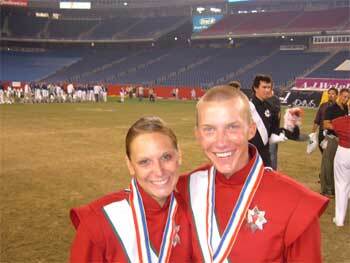 I played mellophone for the Colts in 2003 and 2004, and have been with the Santa Clara Vanguard since 2005. I also marched in D.U.M.B (Drake University Marching Band) this past fall. What's your personal practice schedule like? My schedule varies on the day. I try to get at least an hour in a day, more if possible. What does your ideal free day consist of? Preferably someplace with air conditioning, but I did enjoy getting to see all that Washington, D.C., had to offer last year with my friends. Favorite pig-out food: Beef yakisoba (Japanese). In the shower you can hear me singing: Generally I'll be going over show music, otherwise singing whatever tune is stuck in my head at the moment. The last good book I read: "The Inner Game of Tennis" by W. Timothy Gallwey The last great film I saw: "Casanova" Jobs I have/have had: I have worked at a McDonald's and a Fazoli's and I currently work at a small local coffee shop. My favorite TV show: "Family Guy," most definitely. What has been your formative drum corps moment? I have two really formative moments that stick out to me. The first was in Charlotte, N.C., this year when we were playing "Music of the Night" before we walked to the gate. That was when it all clicked for me personally. The other would be the re-warmup that we got to do at the gate finals night, that experience was amazing. What would you be doing next summer if you were not marching? I would be regretting that I was not marching, and going to as many shows as possible. How did you decide to be a member of your corps? The tradition of excellence that the Santa Clara Vanguard has and the integrity the corps has both on and off the field. Marching with Santa Clara has been that impossible dream ever since I found out about drum corps. I never thought I'd get the chance to wear the Aussie and the star. What first attracted you to the drum corps activity? A friend of mine had marched in the summer of 2001 and told me a lot about it afterwards, and with the help of my band director, I got my hands on some drum corps tapes and started to absorb all I could of the activity. What advice would you give to young people who want to march? Drum corps is like learning to ride a bike, if you fall you just have to get up and keep going. It's all about being persistent, and wanting to get better. What I want to be when I "grow up": I hope to one day be a corps director. Favorite drum corps personality and why: This is such a difficult decision. In the end, though, I think I have to choose Myron Rosander. Anyone who has worked with Myron knows just how amazing his speeches are. It truly was a great experience to work with such a legend in the drum corps activity. Best drum corps show ever and why: 2002 Santa Clara Vanguard. It was the first Vanguard show I ever saw live. The year is 2030. What does a DCI show look like? Drum corps has come a long ways in the past 10 years, so I won't even try to predict what a show will look like 24 years from now.